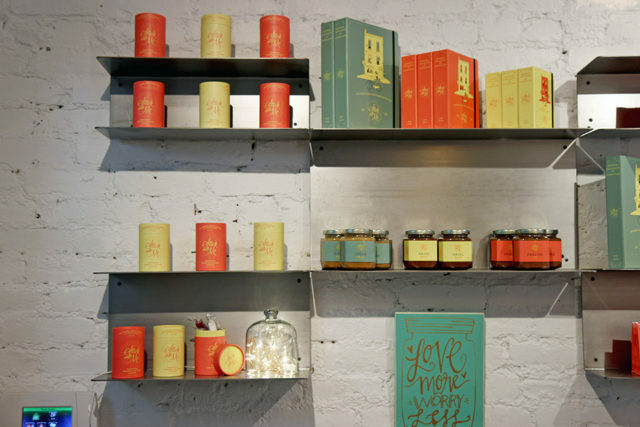 I love the exposed white brick and the cheerful color scheme chosen for the packaging. Bright and fun, but still sophisticated. 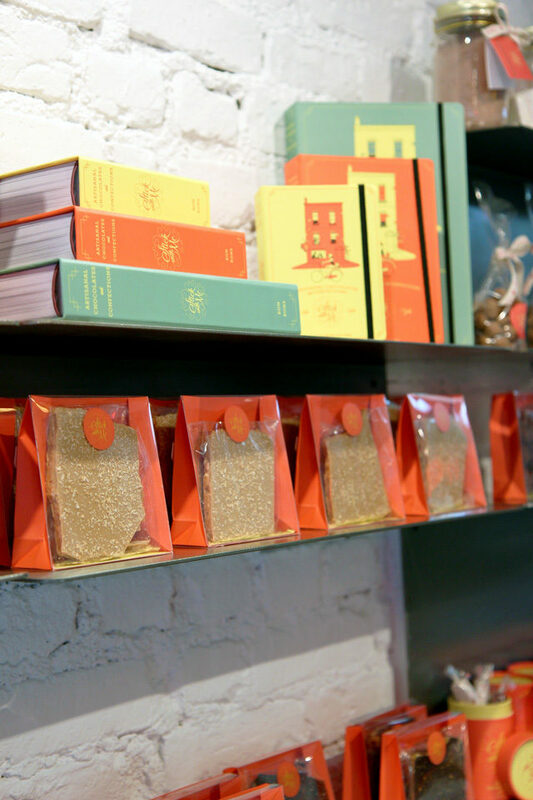 Chef Yoon was partly inspired by Wes Anderson’s Grand Budapest Hotel when it came to the packaging and color scheme of the store. 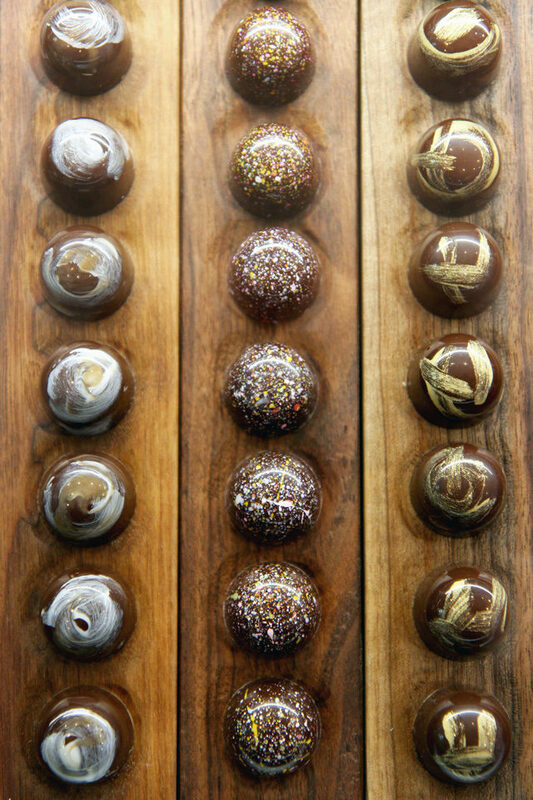 These bonbons are an entirely unique creation, the likes of which I have never encountered anywhere else. 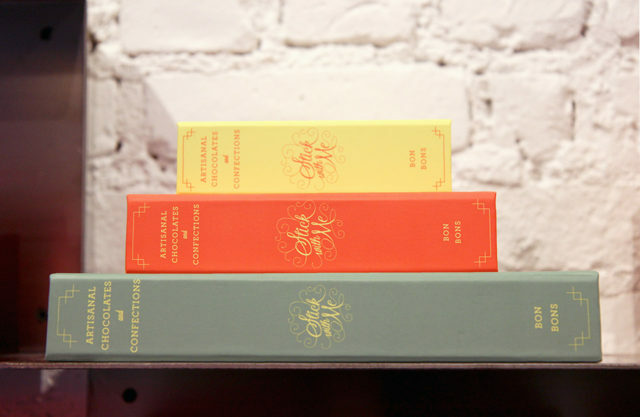 First and foremost, they are little works of art – literally. 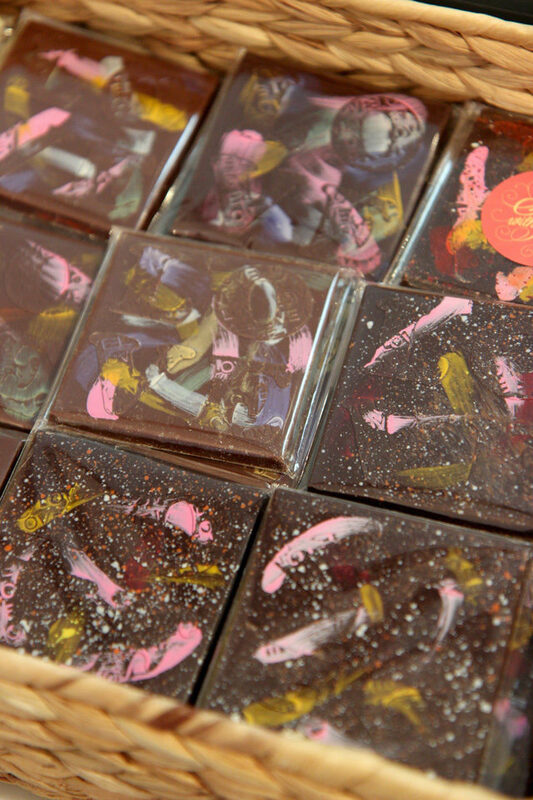 Using various techniques and tools such as splatter “painting”, airbrushing, little paintbrushes, and even a simple thumb stroke, Chef Yoon applies colored cocoa butters to each bonbon. 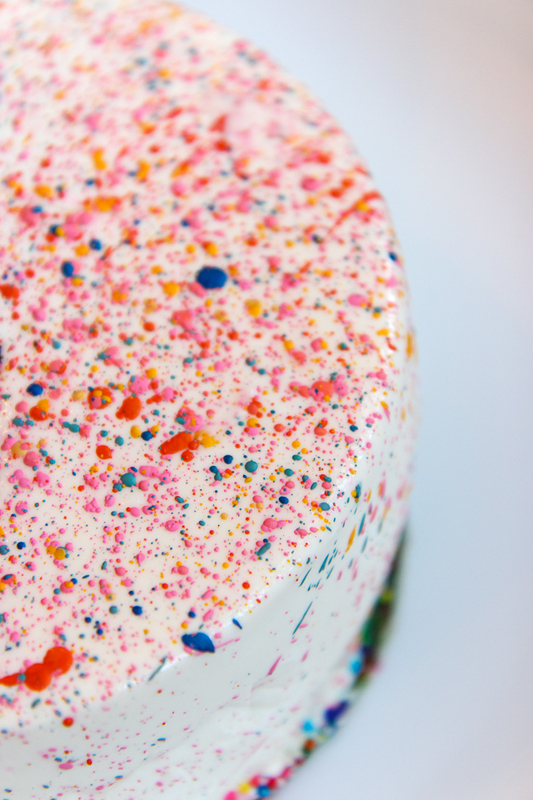 This creates the most beautiful, paint-like effects, and even cooler? 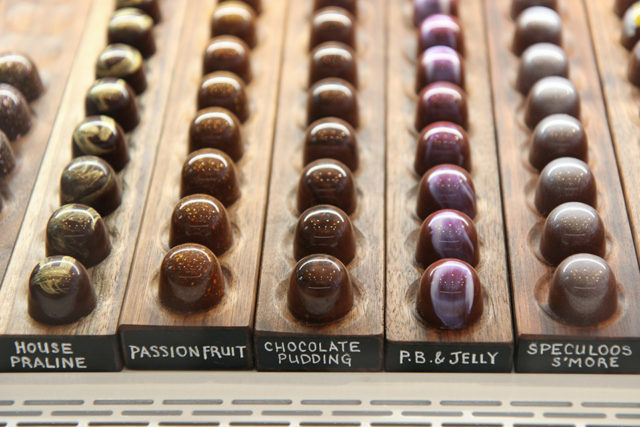 The colors of the “paint” subtly suggest the flavors within each candy. So fun! 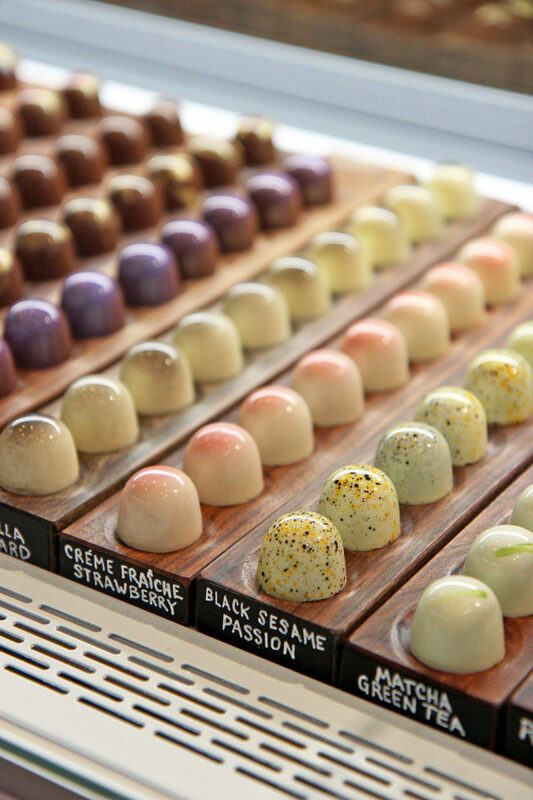 The bonbons themselves move from dark chocolate, to milk, to white within the display case. 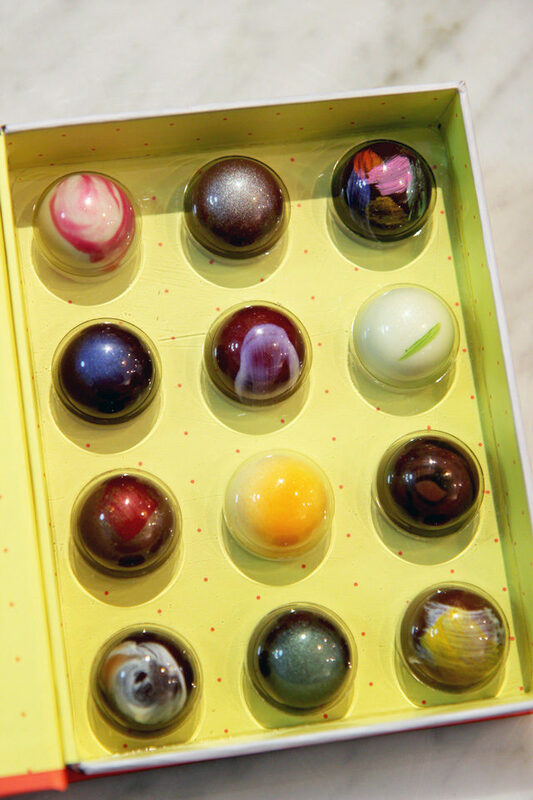 The other thing that makes these bonbons unique is that, unlike traditional truffles (where the middle is typically chocolate ganache or a similar soft filling) the centers of Chef Yoon’s bonbons are filled in layers. Each individual component of the filling is made in the kitchen, then layered inside the shell so that rather than tasting just one thing when eating these, you instead get an abundance of different textures and flavors with each bite. The best example is probably the Speculoos S’more; upon biting into it, you can see, and taste, a little marshmallow layer stacked atop a tiny speculoos cookie. Not all fillings are stacked – the Créme Fraîche Strawberry had a light, fresh, cheesecake-esque filling that I absolutely loved. 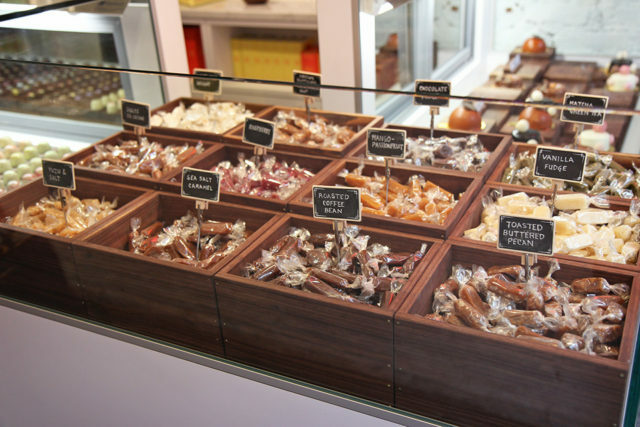 The lovely, one-of-a-kind wood displays are hand-crafted by Grain and Gatherings. 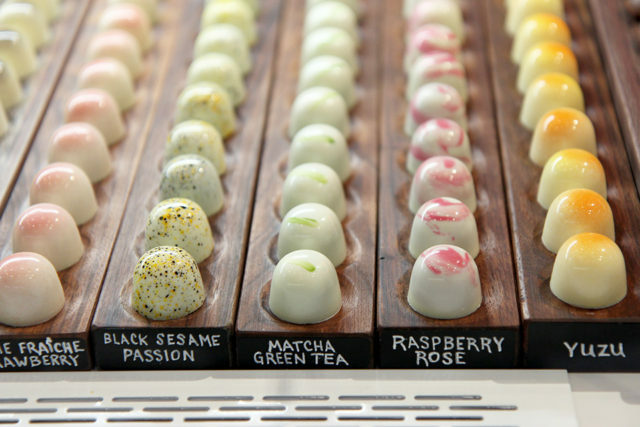 Each is unique and set a different height, so that the various flavors stand out from one another. 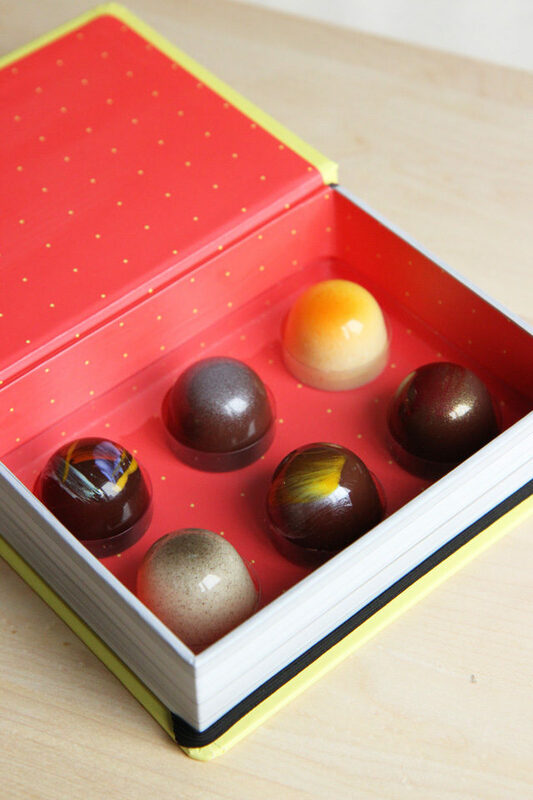 The book gift boxes are just so charming, and great for storing jewelry or other small items after you finish your chocolates. 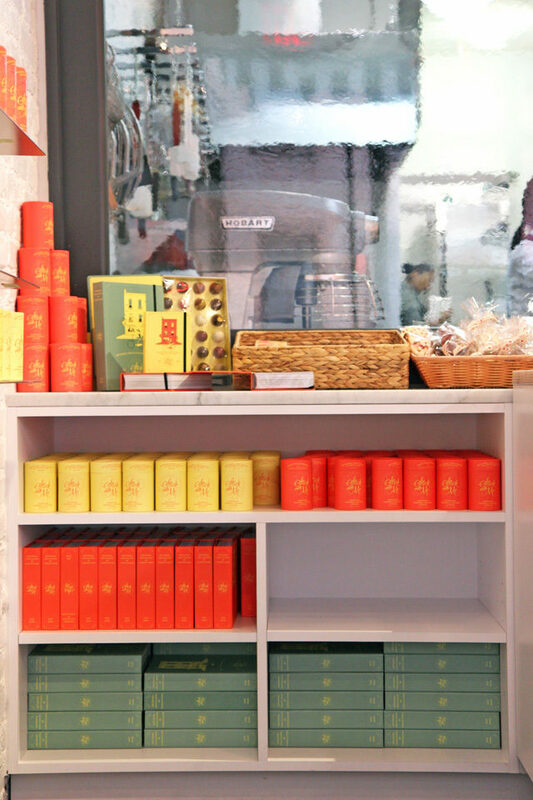 You can get a box of 6, 12, or 24 bonbons…such a fantastic gift idea for anyone with a sweet tooth. 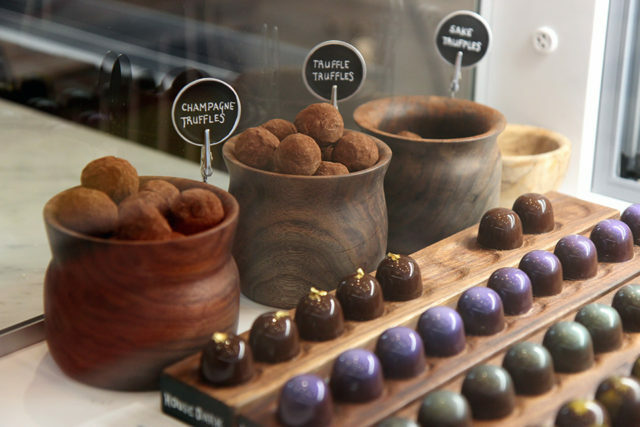 For those who like to stick with tradition, Chef Yoon also offers classic truffles. 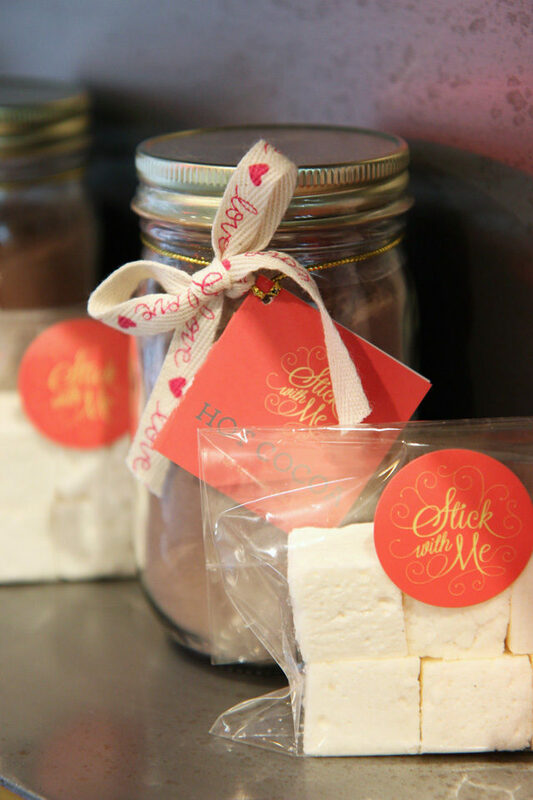 The bonbons are what really draws the eye, but Stick With Me Sweets also offers many other hand-crafted treats that are equally as pretty and delicious, such as handmade fudge, caramels, nougat, dulce milk jam…the menu goes on. 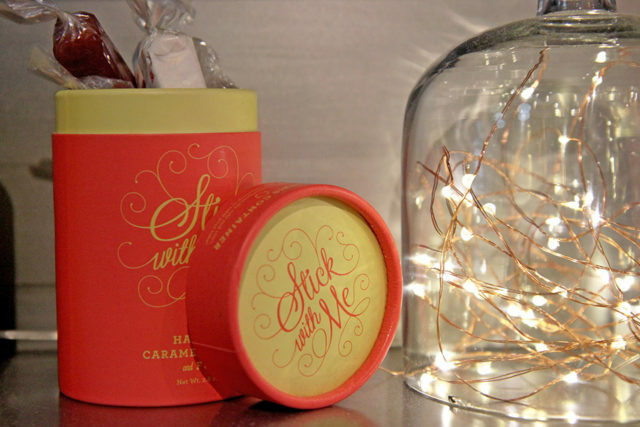 I sampled a raspberry caramel, which is not something I would typically go for (not a big fan of raspberry), and was pleasantly surprised to find that I loved it! It wasn’t sticky at all, as caramel tends to be, and the raspberry wasn’t overpowering. It was juicy with a wonderful, soft texture…really fantastic. 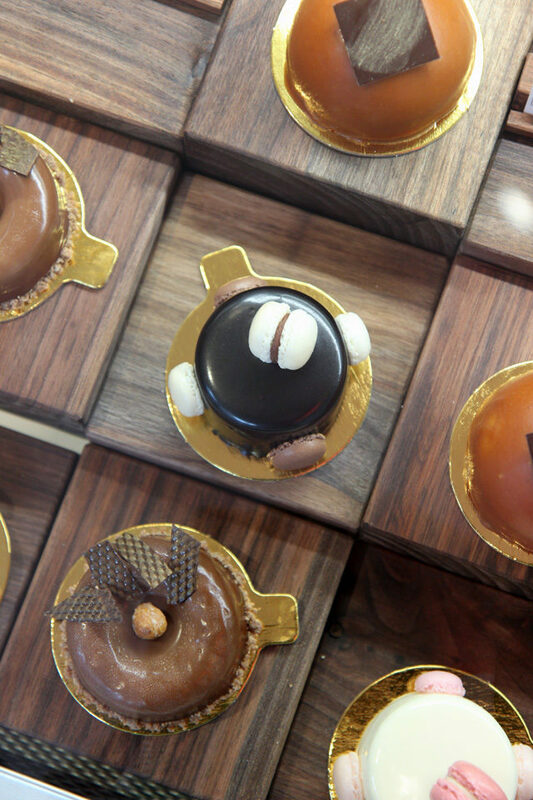 Gorgeous, gorgeous cakes. 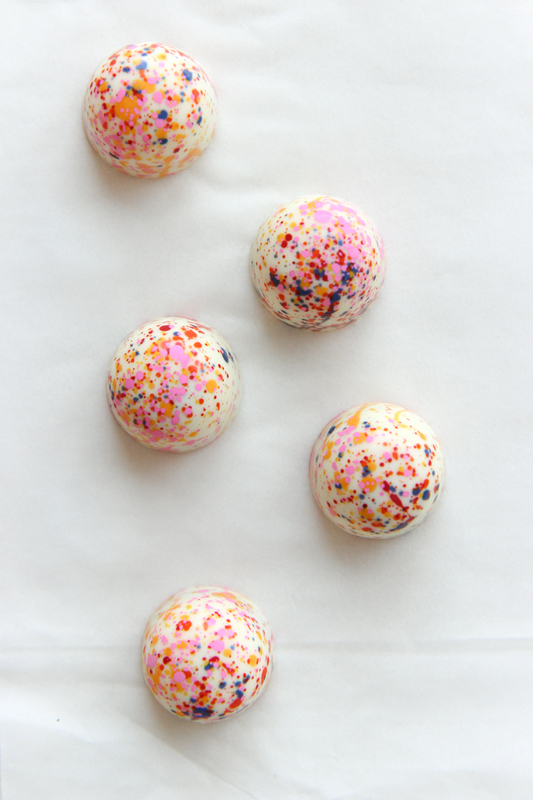 Little works of edible art. 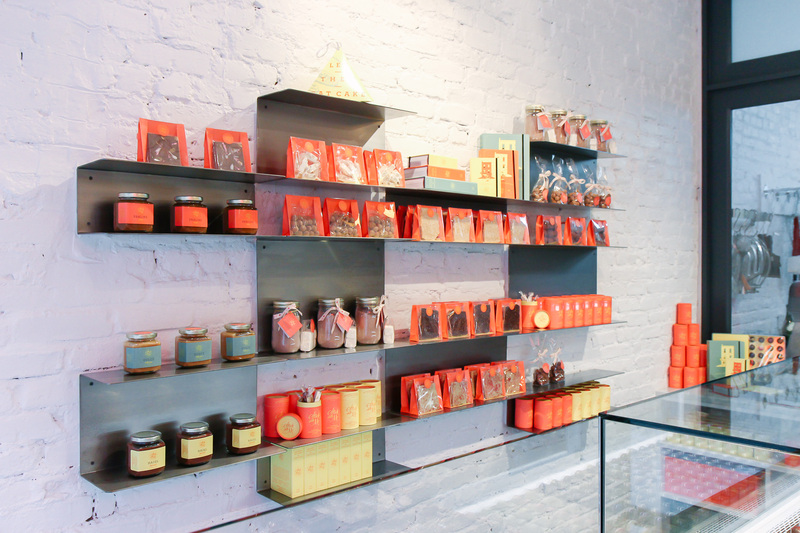 The kitchen is separated from the shop by glass, so you can see Chef Yoon hard at work in the kitchen tempering chocolate, pouring bonbon shells, and creating the many components that make up the bonbon fillings, as well as working on the store’s other treats. 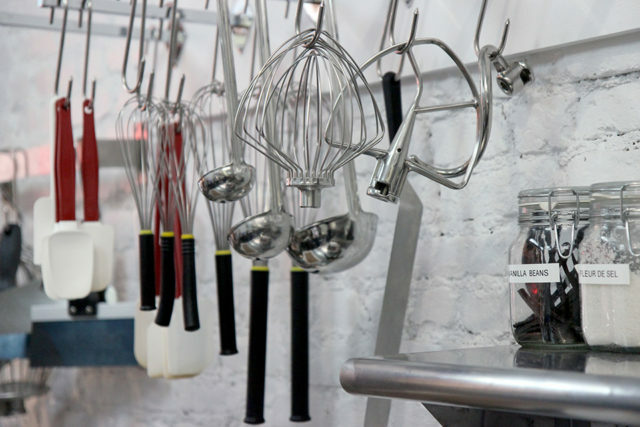 Being as obsessed with sweets as I am, I was beyond thrilled to get to join Chef Yoon in the kitchen for a little tour. 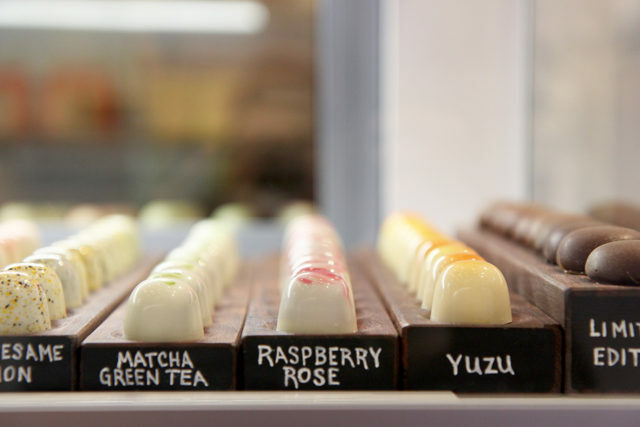 It was fascinating to see bonbons in various stages of completion and to learn more about the ingredients and equipment used in the creation of these treats. 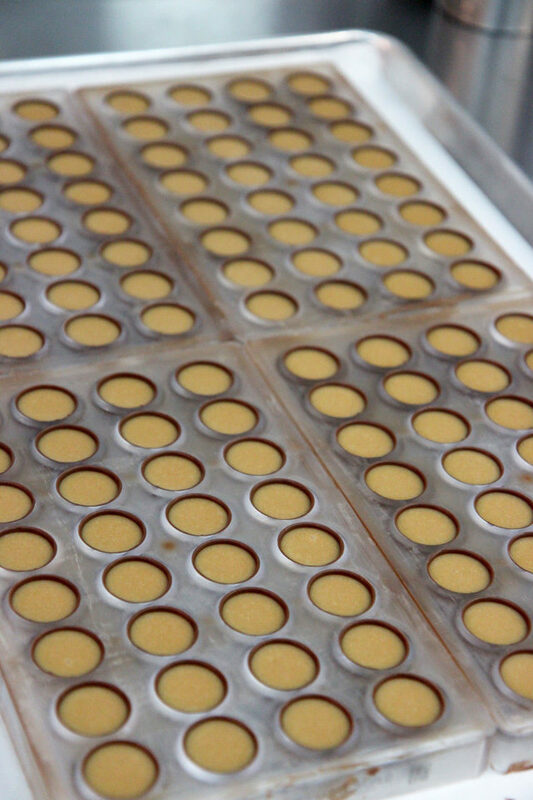 Another thing that makes these bonbons so beautiful is how glossy and shiny they are, a quality attributable to Chef Yoon’s skill in tempering chocolate. 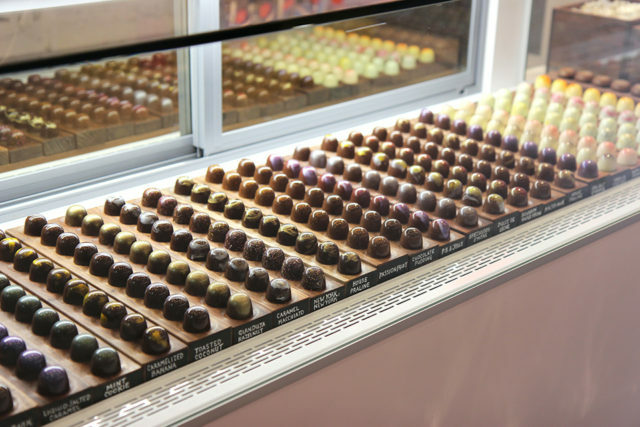 They also polish each mold individually to ensure that the chocolate domes stay as smooth and shiny as possible. That is some seriously incredible attention to detail! 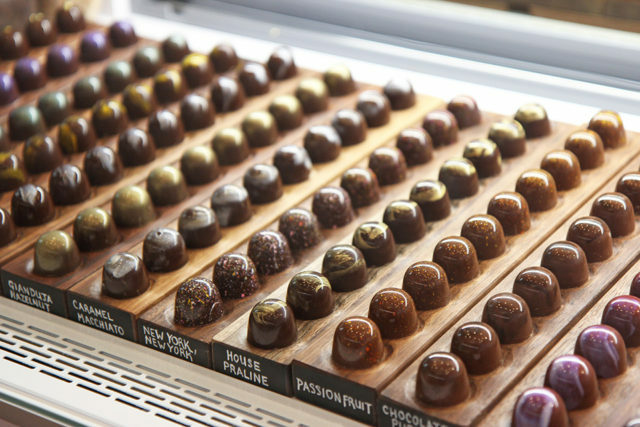 Another great quality of these bonbons is how thin the chocolate shells are, which is not an easy feat to achieve and makes them (in my opinion), more pleasant to eat than typical chocolates. This is the 6-piece book box that I took home. I planned on enjoying my bonbons over a few days but wound up eating them all in one sitting (right before dinner too…oops!). Completely addicting. The Vanilla Custard was one of my favorites, with it’s smooth center of silky custard flecked with gorgeous specks of real vanilla bean. The Dulce de Leche was also smooth and silky, and the Yuzu was refreshing, bright, and tropical, like biting into a juicy citrus fruit. 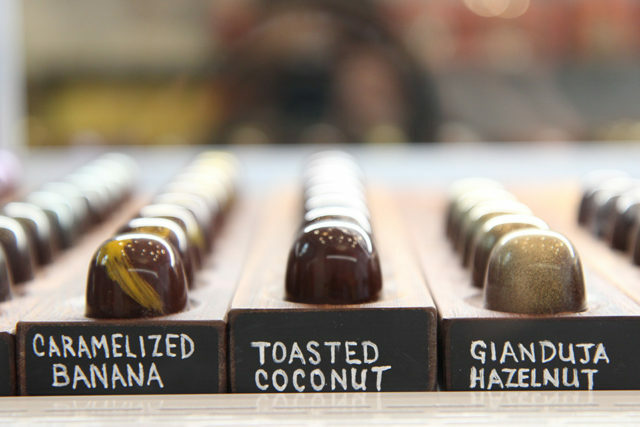 None of the flavors are overly sweet, and the thin shell keeps the chocolate in perfect balance with the fillings. 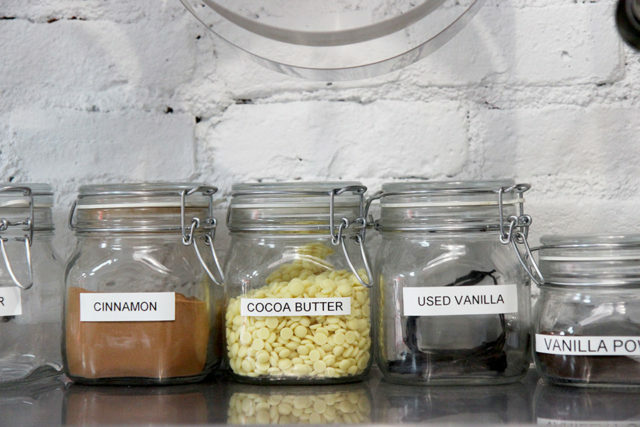 Speculoos S’more was another favorite, and the Bourbon Maple Pecan…wow. 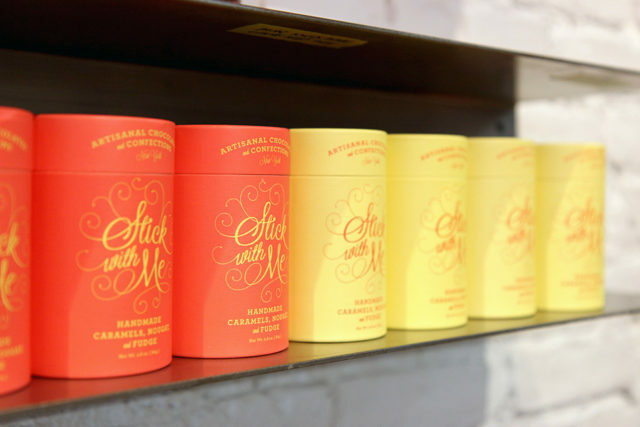 The moment I finished them I found myself trying to work out how soon I could return to try the rest of the flavors, like Passionfruit and Malted Milk Chocolate. Aside from everything else, probably the nicest part of Stick With Me Sweets is how incredibly warm and welcoming Chef Yoon and her staff are. 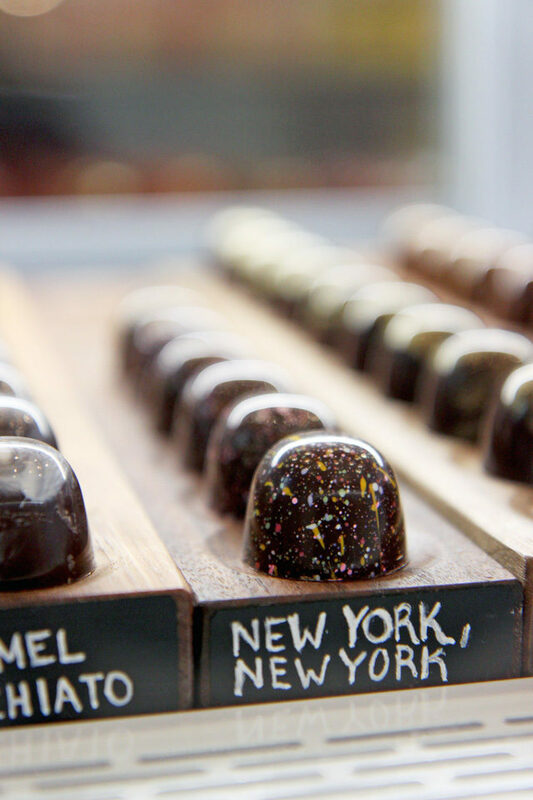 I was definitely a little intimidated to meet such a talented and accomplished chef, but she couldn’t have been friendlier and I had such a great time chatting with her and learning a little of what goes on in a chocolatier’s kitchen! 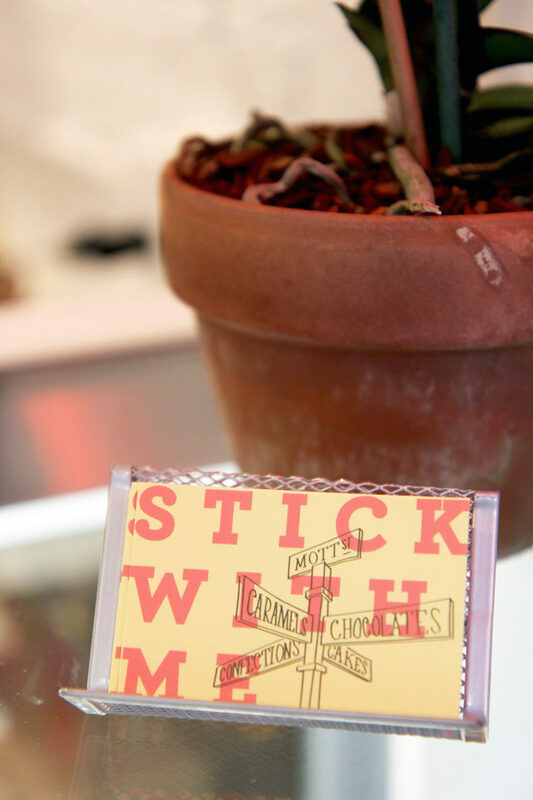 I definitely recommend popping into Stick With Me Sweets if you’re anywhere in or near NYC, and if you’re planning a trip, this is definitely a place to add to the top of your list. 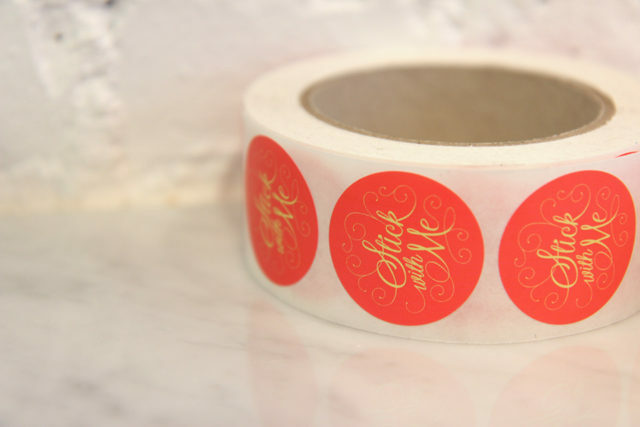 And, needless to say, if you’re in need of a last-minute Valentines Day gift, you just found it! Amazing! Can't wait to try it!! I LOVE those book boxes! Can't figure why Belgian chocolate makers haven't launched their own sets!!! Needless to say, I just need to go back to NYC. Those sweets look unbelievable! 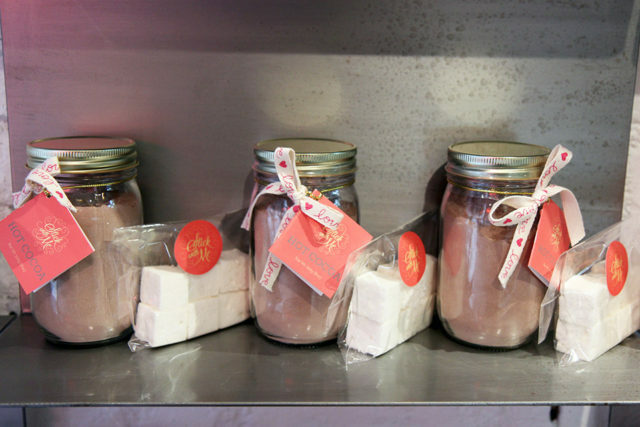 I would treat myself to these for valentines, in secret, so I wouldn't have to share. Plus, I could gaze upon them for as long as I like without disruption. Thank you for this wonderful feature. 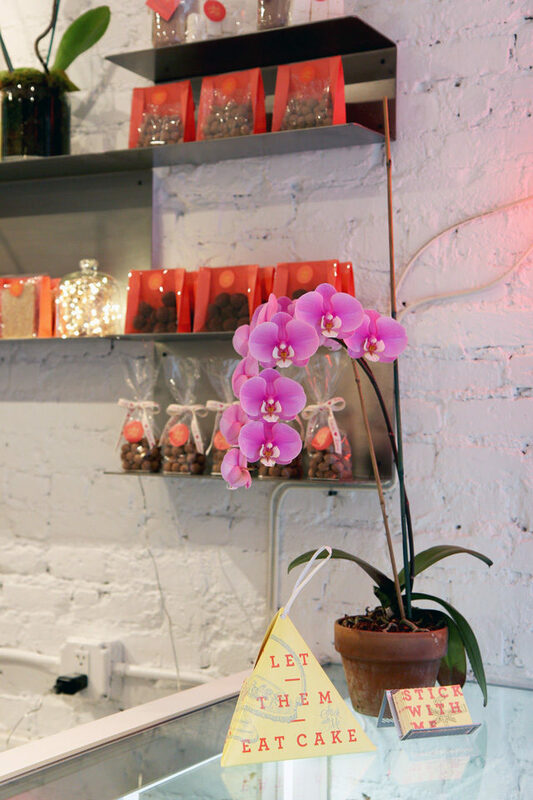 I'm going to seriously consider visiting similar shops in my city. Hehe, seriously, would not want to share these! They're just too good! Oh my gosh, stop it. 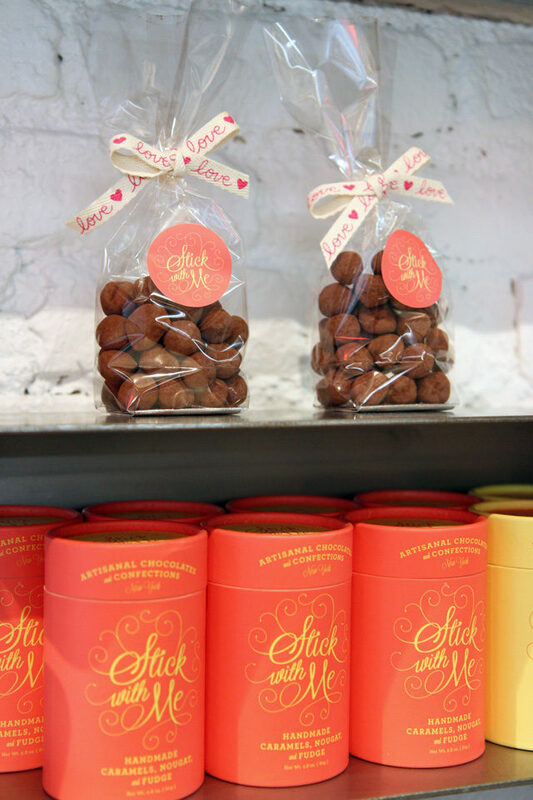 Those bon Bon boxes are amazingly adorable! 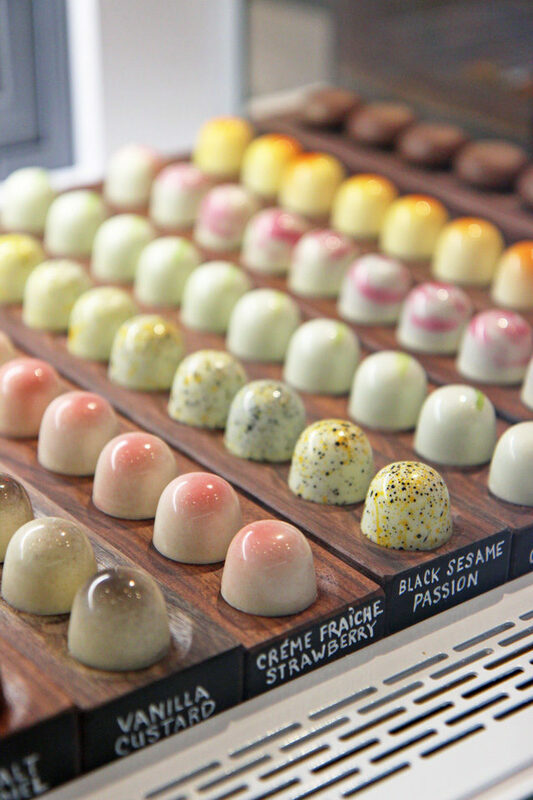 And the sweets each look like little works of art! 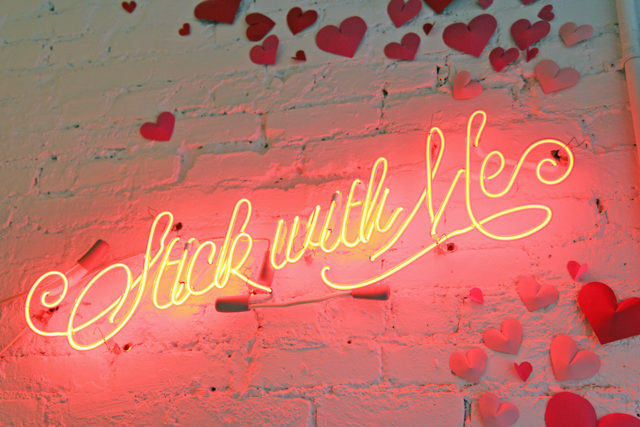 I hope you have a lovely and love-y Valentine's Day! 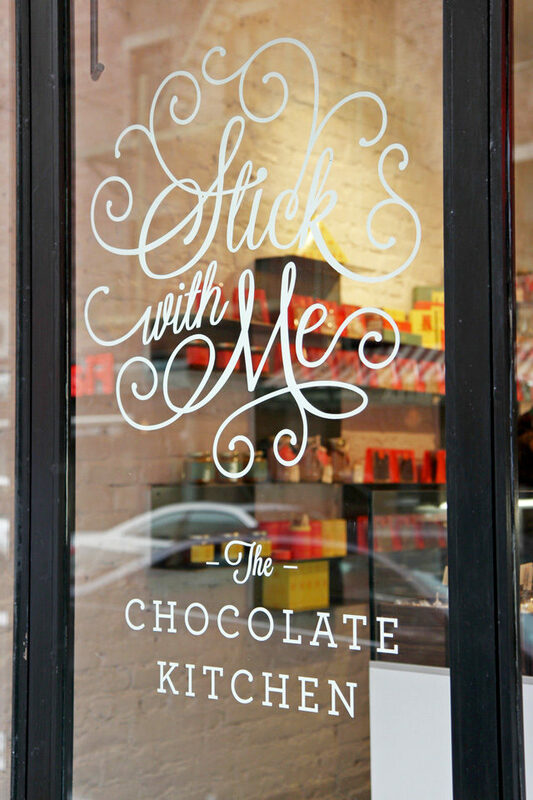 I like the name, it’s very sweet! 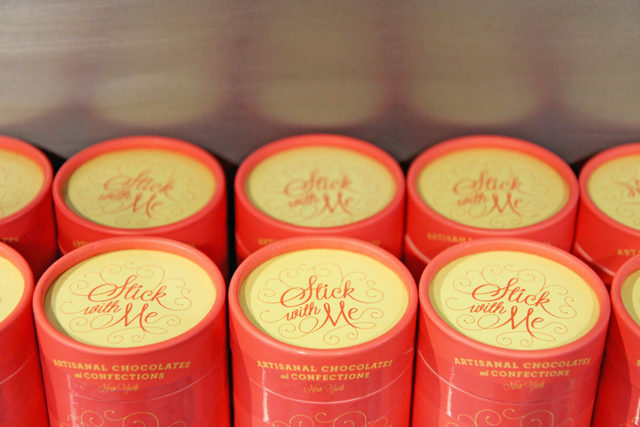 And the chocolates look mouthwatering!